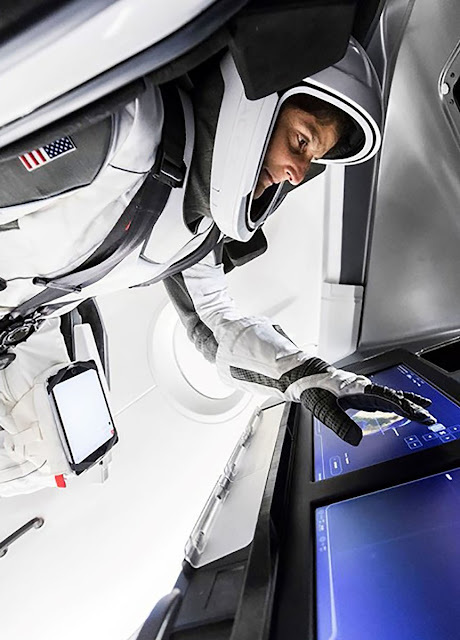 Commercial Crew astronaut Suni Williams wearing a SpaceX spacesuit while training with a mock-up of the Crew Dragon in Hawthorne, California, United States. Crew Dragon, SpaceX’s "next-generation spacecraft designed to carry humans to the International Space Station and other destinations." "With four windows, passengers can take in views of Earth, the Moon, and the wider Solar System right from their seats, which are made from the highest-grade carbon fiber and Alcantara cloth. Crew Dragon features an advanced emergency escape system (tested in Spring 2015) to swiftly carry astronauts to safety if something were to go wrong, experiencing about the same G-forces as a ride at Disneyland. Crew Dragon’s displays will provide real-time information on the state of the spacecraft’s capabilities—anything from Dragon’s position in space, to possible destinations, to the environment on board. Crew Dragon has an Environmental Control and Life Support System (ECLSS) that provides a comfortable and safe environment for crew members. During their trip, astronauts on board can set the spacecraft’s interior temperature to between 65 and 80 degrees Fahrenheit. Crew Dragon will be a fully autonomous spacecraft that can also be monitored & controlled by on board astronauts and SpaceX mission control in Hawthorne, California, USA."